Summary: Home Tour Scavenger Hunt is great when played at an Open House or for a House Warming party. 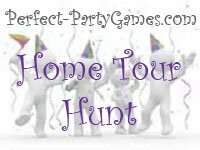 You get to create the scavenger hunt and it then doubles as the home tour. Only the size of your home will limit the number of players for this game. Make a list of objects from various rooms in the house. Provide each guest with a list of items. While they are touring your new home, have them write the exact location of each item they find (given room and detail description like "on the wall" or "southeast corner"). Add challenging items that aren't in plain sight to throw off the guests. The player who find the most items or has the best location description wins the game.